Material: stiff paper, durable and exquisite. Cute animals patterns are printed on banner, full of party atmosphere. Perfect for indoor or outdoor themed parties, picnics, carnivals or other celebration, decorating walls, windows and mantels. Size: banner 9" x 9" - Approximately 6 feet (180cm) in length per string. Includes 8 flags within a string. There are 10 string. Easy to hang. Material: stiff paper, durable and exquisite. 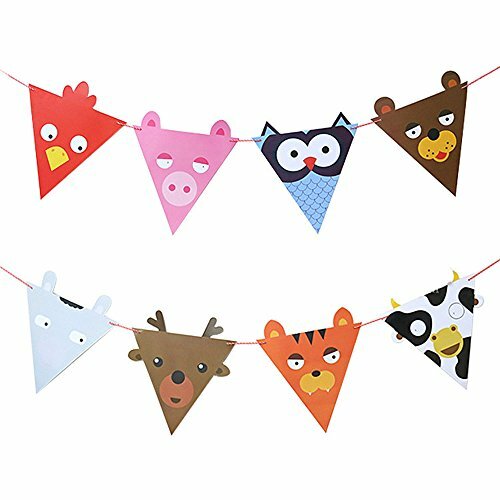 Cute animals patterns are printed on banner, full of party atmosphere. Perfect for indoor or outdoor themed parties, picnics, carnivals or other celebration, decorating walls, windows and mantels. If you have any questions about this product by Riverbyland, contact us by completing and submitting the form below. If you are looking for a specif part number, please include it with your message.